Our frosted pink plastic shopping bags are ideal for retail purchases, special occasions and gifts. Not the typical blue, the soft aqua blue tone of the bags adds a hint of sophistication and style at an affordable price. 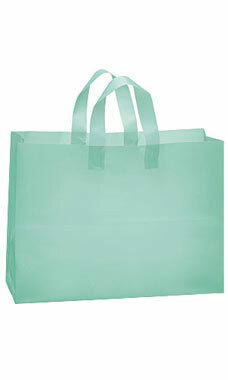 These 16" x 6" x 12" bags feature strong handles and a hard board bottom to provide rigidity. They are an obvious choice for bridal, children's retail and spring holiday sale promotions. These bags are sold in cases of 100.